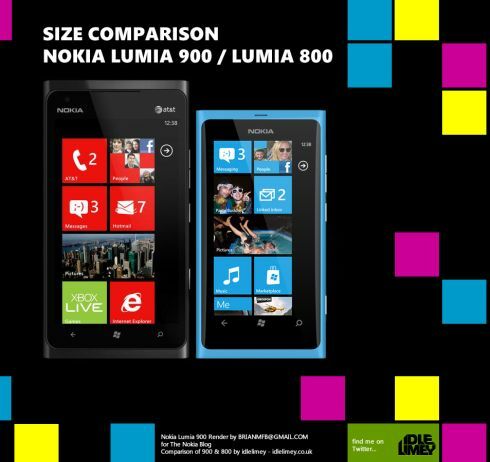 One of the readers from thenokiablog.com created a full mockup of the Nokia Lumia 900, including a comparison with the size of the Lumia 800. You can see this comparison below and know that the newer handset is expected to surface at CES 2012 that starts next week in Las Vegas. This is not an official picture of the Nokia Lumia 900 aka Nokia Ace and as far as I know this phone also goes by the codename Eloko. We’re expecting here an AT&T Windows Phone unit, with 1700MHz band support, 512MB of RAM, a 4.3 inch WVGA display and an 8 megapixel camera with Carl Zeiss technology. A 1.4GHz CPU and 16GB of storage are pretty much sure features and there’s also an 1830mAh battery in the mix, according to inside sources.